Or so I’ve been told by many prochoice advocates. Typically I hear these dismissals touted in tandem with slogans like “My body, my right,” or “stay out of my bedroom!” and followed by a slew of ad hominems (the native language of social media). The not-so-subtle implication is that we prolifers are sore losers whining over a game we lost more than 40 years ago. The Woman-Hating patriarchs lost a grueling battle against Team Social Justice. We antiquarians, just won’t let go of the past. We refuse to join modern history and admit that the law has sided with women. We pro-lifers have lost our monopoly over the private lives of women across the country. And now we’re grimacing over sour grapes. Or so the narrative goes. Believe what you want about the story line, the abortion debate isn’t going away any time soon. The debate has waxed and waned over the decades though it’s waxed more than it’s waned. But why? Why are we still having this debate? Federal courts don’t explain it. Legally speaking, numerous “Fetal Personhood” proposals have been tried and failed to undermine federal abortion-choice policy. Countless anti-abortion cases have come before the courts and, invariably, they’ve failed to dislodge Roe V. Wade (or Doe V. Bolton). The judicial fallout from Roe v. Wade has done nothing to displace or replace abortion-choice policy; if anything, abortion-choice policy expanded, with only minor retractions at the state level. The legal history of abortion-choice policy has effectively pressed and solidified it into legal bedrock, a foundation for modern feminism and human rights ideology. If we were following only the court history of abortion-choice it might look like the ethics of abortion are settled into entrenched law and no real debate remains about abortion per se, but about regulatory burdens and interpretive details. With such “settled” decisions at the federal level one would think that prolifers would just “move on” already. People aren’t debating women’s right to vote, or about the abolition of slavery. They are the settled achievements of federal legislation and federal courts. Prolifers need to get with the program, right? Move on already. But prolifers aren’t “moving on.” Indeed anti-abortion sentiment is as hot as ever. Many metrics suggest the prolife movement is “winning”. According to Vox.com the battle has shifted from the Federal level, a losing game for Prolifers, to the state level: “Abortion access has changed dramatically,” says Elizabeth Nash, state issues manager at the Guttmacher Institute. “The debate at the federal level affected what happened at the state level,” where abortion restrictions have swelled, “and accessing abortion is much more difficult in 2014 than it was in 2009.” Sharing Guttmacher stats, Vox reports 394 abortion-restrictions have been passed just since 2001; and 205 of those between 2011-2013. 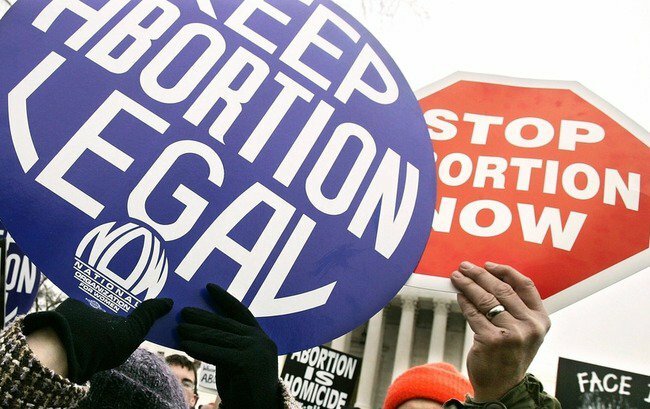 Antiabortion laws are rising exponentially, but at a state level. Prolifers have found a winning strategy, and it’s State-based. Prolife winds are even reaching prochoice camps. The radical prochoice positioning popular in the 1980’s (unqualified full-term abortion access) is losing ground to moderate prochoicers who readily admit that abortion is “evil” but they argue it’s a “necessary evil.” Some moderates, and not-so-moderates, don’t even like the term “prochoice” preferring some other abortion-choice terminology. Moderates often approve of notification laws, restrictions in the 2nd and 3rd trimester, and bans on partial birth abortion. They don’t necessarily think of the child-in-utero as a “person” or even a “full human being,” but it’s still a gut-wrenching tragedy to lose that life even if abortion was the best option. Polling data agrees: Abortion continues to rudely include itself in our political conversations. A May 2015 Gallup poll reported that 21% of voters refuse to vote for a presidential candidate who disagrees with their views on abortion. This number is up 9% since 2009. And those who consider abortion a marginal issue declined 10 points in the same period from 37% to 27%. The “moderate middle”, at 46% aren’t so polarized but still consider abortion an “important” issue among several key factors. These stats aren’t earth shattering, but they reflect a stubborn fact: the abortion debate isn’t going away. In other reports, abortion totals appear to be declining across the United States. One can point to an increase in anti-abortion legislation, or to contraceptive use, or even to a reduced sexual activity among unwed couples. But whatever the cause, optimists could propose a natural resolution here. If abortion is still legal, while the number of abortions are dropping, perhaps the abortion debate is resolving itself. Perhaps abortion access could remain fairly open (compared to most of Europe, American Abortion policy is radically liberal), but young people are declining the option, having no need for it. Prolifers can celebrate the declining abortion rate while prochoicers celebrate the empowering fact of liberal abortion access. It’s a win-win. Indeed, abortion access in the U.S. is still more open than most anywhere else in the world. Anyone in America who wants an abortion can have one for less than $500 dollars within driving distance (<3 hour drive). Yet this optimistic interpretation doesn’t disband the abortion debate, and there’s no signs of it slowing down. If anything the debate has kept a relatively steady incline over time. The prolife forces have been churning, and their side of the debate has only grown in recent years. PriestsForLife.org, lists 470 prolife organizations in the U.S. but doesn’t include such recent entries as LiveAction or LifeNews–two of the most influential prolife sites today. And of course there are anti-abortion groups that reject the term “prolife” like AbolishHumanAbortion which has dozens of chapters across the United States. And there are other prolife or abolitionist groups which suppress their affiliations for different reasons such as undercover work, for example, the Center for Medical Progress which allegedly exposed fetal tissue harvesting. On the Prochoice side of the debate, the voice grew loud and shrill as the “War on Women” rhetoric was fanned into flame in the 2012 election cycle. And that strategy worked well that year, for the purposes of the presidential election, but given the loss of a democratic majority in the House, and later the loss of the Senate in 2014, the “War on Women” rhetoric might have been an overreach. Indeed prolife legislation only grew between 2011-2016. In the current election cycle, democrats have retained prochoice positioning with Bernie Sanders and Hillary Clinton modeling the “old school” prochoice position (abortion anytime, for any reason, for any woman). Hillary Clinton sometimes touted as the women’s candidate has the express support of Planned Parenthood and NARAL. But the rhetoric appears a bit softer, adjusted for millenial audiences who trend weaker on the prochoice position. To keep pace with contemporary prochoicers one cannot just point out the suffering of mothers strapped down with an unwanted pregnancy, one must also tip a sympathetic hat toward the destroyed fetus, admitting that some restrictions might be justified. In the age of 3D sonograms and provocative “bloody baby” pictures tactics on the right, many prochoice advocates have eased up on the gas pedal. Even if they don’t think that fetus is a rights-bearing human being, it’s still a bloody mess to clean up. It seems the center of the prochoice camp has shifted sympathetically towards the more moderate prochoice positions of the European States, where only the Netherlands rival the U.S. in open access to abortion. Hillary Clinton, for example, focuses on the choice of abortion as one of the “most difficult” decisions, and while she has, in the past supported partial birth abortion, she is reluctant to say such things during campaign season. And she can sound downright contradictory when she refers to the fetus as an “unborn person who doesn’t have any constitutional rights.” If it’s a legal person, then it has constitutional rights. The prochoice camp also took a major hit with the “fetal tissue harvesting” allegations from Daniel Daleiden and the Center for Medical Progress. The case is still in pending litigation (at the time this article is written), but whatever the outcome may be, it is clear that Planned Parenthood had been surrendering fetal tissue samples for lab testing companies with some remuneration (allegedly “payment”). This story distorts according to who’s reporting, whether they lean toward the political left or right. But it’s indisputable that Planned Parenthood had their public relations department working overtime to mitigate the fallout from this alleged exposé. All of this means that the abortion debate isn’t going away. The anti-abortion side is gaining steam in different ways. But the entrenched establishment is pro-choice. That is, the law of the land still dictates that some humans don’t qualify for human rights. And the bedrock of Roe v. Wade is now the foundation of a vast abortion-choice network of laws, lawyers, and organizations whose livelihood depend entirely on liberal abortion-choice policy. Add to that fact how every election cycle pulls off any scabs on that old wound. Whether on the right or the left, all sides stand to gain votes and strengthen campaigns if they can describe the abortion debate in a winsome way for their side. The abortion debate rages on. Mississippi has only one legal, active, abortion clinic, Jackson Women’s Health Clinic (a.k.a., “The Pink House”). But it’s located in Jackson, in Central Missippi. It’s no more than 3 hours drive from the farthest edge of the state.